November is upon us all ready and I have been left completely baffled about how fast this year is going but as a month has ended its time to chat about what I have been loving through October. Now if I'm honest I just love October in general, autumn is in full swing and Halloween makes its yearly appearance. However lets get to talking about the individual things I have been loving this past month. So first up I have been totally obsessed with these Essence Candles I picked up from B&M. Now the quality of these just amazes me for the price you pay. They are also dupes for the Bath and Body Works candles that unfortunately we cant get our hands on the UK so that's a massive bonus, As appearance wise they are probably the closest thing Ive seen to the Bath & Body Works ones here in the UK. 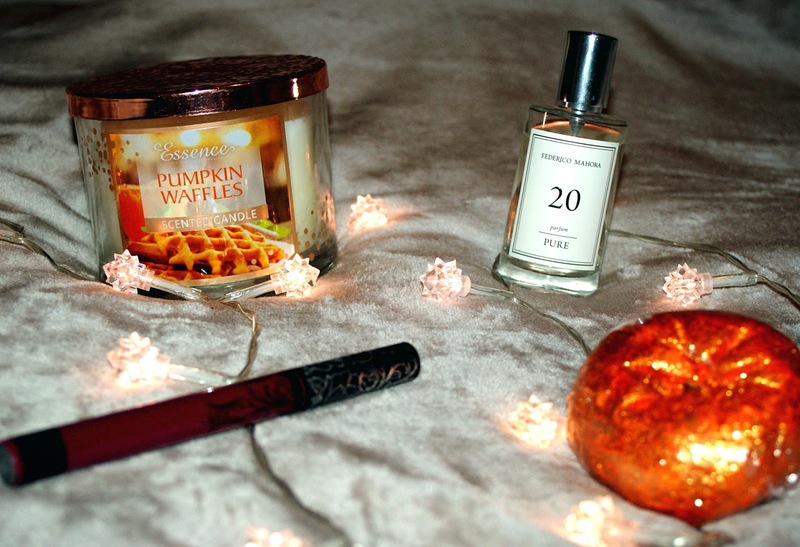 I have especially been loving the scent Pumpkin Waffles. So if your looking for some amazing candles to get you through the Autumn/Winter months but don't want to splash too much of your hard earned cash deffo check these guys out. I did a whole other post on these candles so if your interested feel free to check that out my lovelies. Next up is a Lush product which lets be honest who doesn't love a Lush bath all the time but I have been loving the Sparkly Pumpkin bubble bar a whole lot this month. There's not much to not love its hella pretty, Smells flipping gorgeous and leaves your skin soo silky smooth and soft. Another thing I have loved to death this month is one of the lovely Kat Von D's Everlasting Liquid Lipsticks. Now if you know me you will know I'm a sucker for a dark lip and boy oh boy have I just fallen in love with this little gem. It is the most perfect dark plum colour and I have had it on my lips pretty much non stop all of October. Finally my last favourite is actually quite a new find to me and I was very surprised by how much I loved this. Now a lovely lady I know has started selling for a brand called the FM Fragrance group. Now this company makes fragrances which are very simple in terms for packaging and that are quite affordable but they are supposed to be dupes for some of the designer fragrances we all love so much. Now I don't know about you but as much as I love some designer fragrance the price tag is sometimes a heavy hit to handle. Now as I am quite new to this I have only tried Number 20 which is supposed to be very similar to Viktor and Rolfs Flowerbomb. I honestly think It smells very similar and it lasts well throughout the day. I really can't complain so far with my experience of FM Fragrances as I love being able to spritz away with no guilt of my pricey perfume being wasted away. That's it for my October Faves hope you enjoyed reading! Sorry this post was a little late I'm really working on trying to get back on track with everything and its taking a little time to adjust.